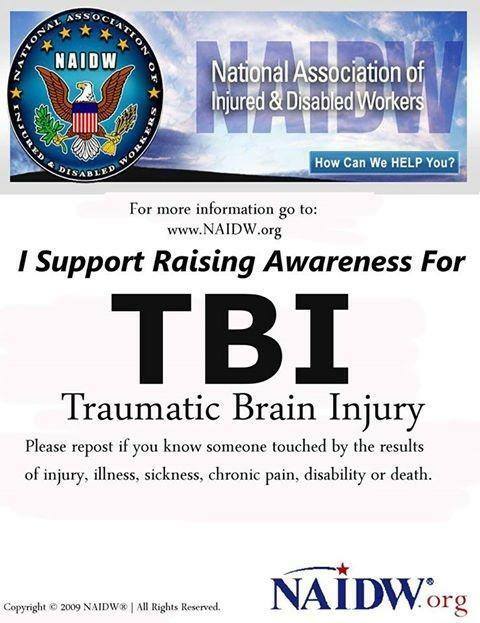 Military or Civilian Got #TBI? 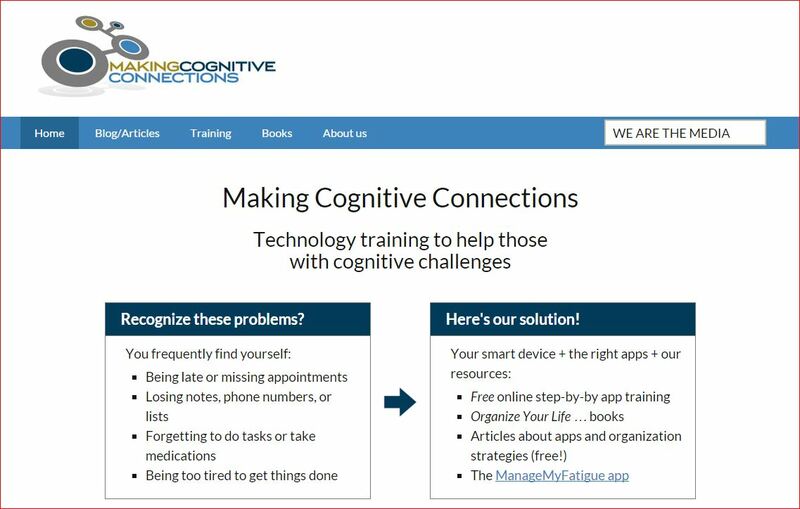 Imagine a $3 App to Help Brain Injury Survivors! Your Vote & Support Counts! Step #1: Go the following website: dcoe.ideascale.com…. With tremendous appreciation for Aaron’s ‘Guest Blogger’ communication and Warrior Spirit, please read the full missive and see below for full instructions…THANK YOU THANK YOU THANK YOU! 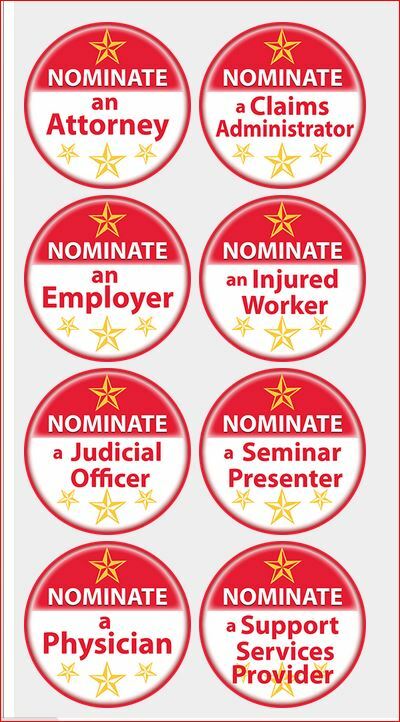 Subject: Your Vote & Support Counts! Greetings, I am writing this letter on behalf of myself and my good friend Shawn Miller. As those of you who know us are already aware, Shawn and I are both attending the Coastline Community College Acquired Brain Injury Rehabilitation Program in Newport Beach, CA. Shawn and I are both working hard to recovery from our respective injuries…his, a stroke suffered approximately a year ago, mine traumatic brain injury suffered as the result of my military service. Our recovery has been aided in great part by someone who means a great deal to both of us, Michelle Wild. Michelle is one of our senior cognitive rehabilitative instructors at Coastline College and to us, is likely the closest thing to an angel that either Shawn or myself will likely ever see. After realizing the possibilities of how smart technology (IPADS, Smart Phones, Laptops etc) could be used to help her students recover from brain injury, Michelle took the initiative to develop a computer application called Manage My Fatigue that allows her students to do something that most of us after brain injury are no longer capable of doing…keeping track of time and properly managing our levels of mental fatigue. 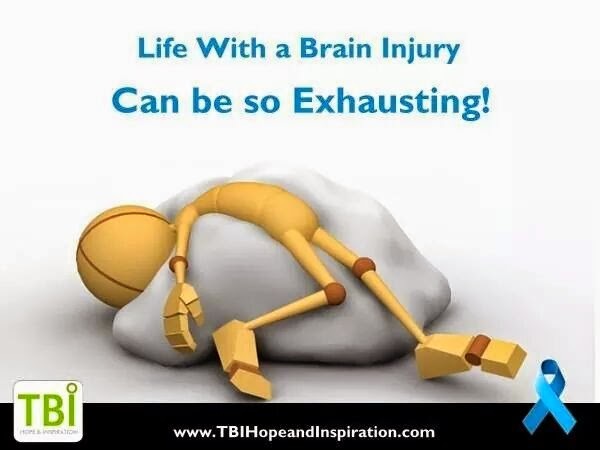 Although it might not be immediately clear to others, in most cases, where most people who have suffered a brain injury really struggle are in two areas…we lose track of time and we get easily overwhelmed. 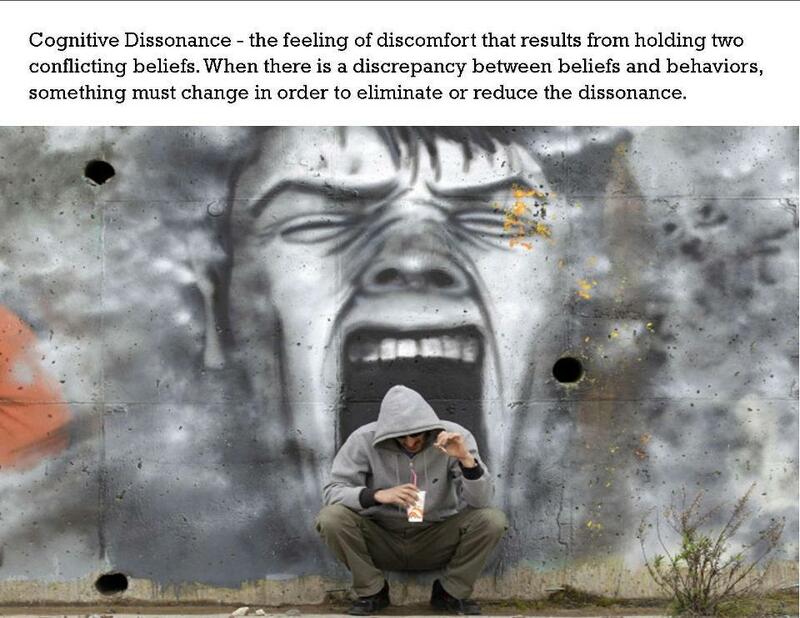 Unfortunately, when this happens…to one degree or another, many of us also struggle with controlling our emotions too which often times makes an already bad situation, worse. 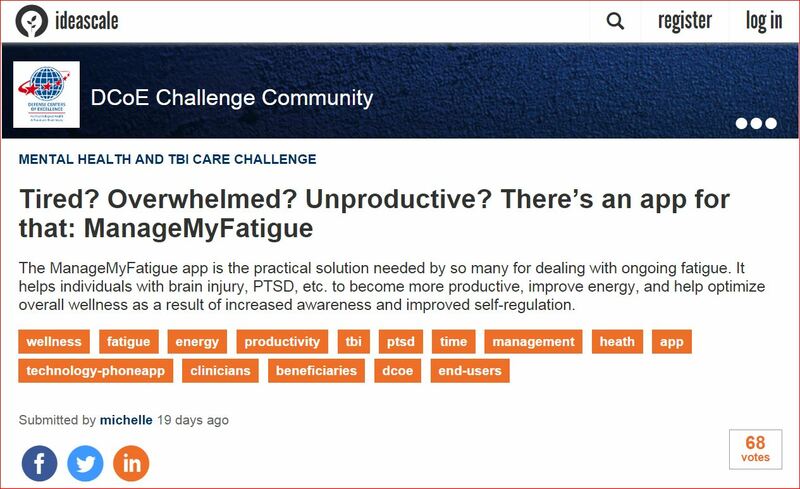 The Manage My Fatigue Application specifically addresses these issues and many more…and for the first time in history…gives people struggling with the effects of a brain injury a tool that can help us prevent many of these struggles, struggles that many of us live with every day, from ever even occurring. As most of you who already know me are aware, aside from facing the struggles that everyone who has suffered a brain injury faces…regardless of how their injury occurred, my story has had a few additional twists and turns which until the Walter Reed Hospital and the VA scandal’s broke over the past couple of years, would have probably have been thought to be unimaginable. Unfortunately, as those stories and the stories of many of your own loved ones who served their country can likely attest, as of right now, stories such as mine are not the exception, but the rule. I mention this not for want of sympathy because sympathy without solutions, serves no purpose. I mention this, because my experiences have given me the unique perspective of realizing just how important Michelle’s work truly is. I have observed through first hand experience just how the system works or more importantly, where it doesn’t…but until recently, I had identified a long list of problems…but was short on solutions. Why do I say this? Because the Acquired Brain Injury Program at Coastline Community College was not where I began my search in seeking help for the many cognitive problems I was having…but only where I ended up here after becoming hopelessly lost and homeless after spending nearly three years trying and failing to get the help I desperately needed through first the VA and then the Army before ultimately becoming homeless. As a U.S. Army Master Sergeant and Chief of Training who spent many years designing training programs for thousands of Marines and Soldiers getting ready to deploy into harms way, and often training the instructors who were responsible for training our nations service members to make sure many of our nations sons and daughters were ready for what was to come who again, has experienced some of the worst scenario’s imaginable firsthand…one and off the battlefield, and who was recently medically retired from the military due to traumatic brain injury, let there be no doubt in anyone’s mind that as of today, neither the VA nor the Department of Defense has a program that currently comes close to treating those of us who have been affected by brain injury in the way that Michelle’s Manage My Fatigue Application has done for Shawn and I and has the potential to do for thousands more yet to come. For the first time in years, Shawn and I have the hope and faith that one day, with the help of this application and the many other gifts that our instructors have given us through their efforts…that not only will we one day make a full recovery, but so too will the many friends that we have both made who sit to our left and right in class. By writing this letter, it is our sincere desire that we can share that hope with the thousands more who, if given the Manage My Fatigue Application as part of their treatment, could likewise benefit and share in the modern day miracle that we have both received. It is with that in mind that I am writing this email and asking that you send it out to everyone that you know and ask them to do something that would mean so much to both Shawn and I and vote for Michelle Wild’s Manage My Fatigue Application using either your Gmail or Facebook Accounts and include as many supportive comments as possible to help bring this idea to the attention of our nations senior military leaders and God willing, put it into the hands of our nations injured military veterans being treated throughout the VA and Department of Defense health care systems for Traumatic Brain Injury through a unique competition being offered through the Defense Centers For Excellence. Through this open competition, the Defense Centers for Excellence (A division of the Department of Defense tasked with finding new and inventive ways to treat veterans suffering from TBI and PTSD) all who receive this email and vote, will have the opportunity of a lifetime…the opportunity to do what’s right and do something amazing that will truly make a difference to those out there who need our help the most…that we can both tell you from personal experience and testimony…really works! With your help, Michelle Wild’s Manage My Fatigue Application has the potential to help thousands of veterans (nd many others in need) who have given so much so that we could all enjoy the freedom we just recently celebrated over this past memorial day weekend and who simply want one thing…the hope to live a normal life again. Through speaking to so many people over the past few years doing my best to advocate for veterans, I know very well that nearly without exception, that as a nation, nearly all of you are grateful for the sacrifices that our nations veterans have made and again, almost universally, most of you would love to do something to help…but just didn’t know how. Well folks, here’s your chance. Here’s your chance to thank a veteran in a meaningful way by doing something special…spmething that won’t cost you a single dime…just a moment of your time…the time it will take each of you to read this email, follow the directions below, and vote for the Manage My Fatigue Application using the instructions below. If there were ever a cause worthy of your time and support…this is it! For those of you who already know us, you likely already know the following as well, but for the sake of those who don’t… it must be said. Neither Shawn nor I were ever approached or asked to write this letter or ever offered any incentive for doing so…we just knew in our hearts that it was the right thing to do and ask that you share it with your loved ones as well because we know that with your vote, it could serve as the miracle to so many others that it has been to both of us! 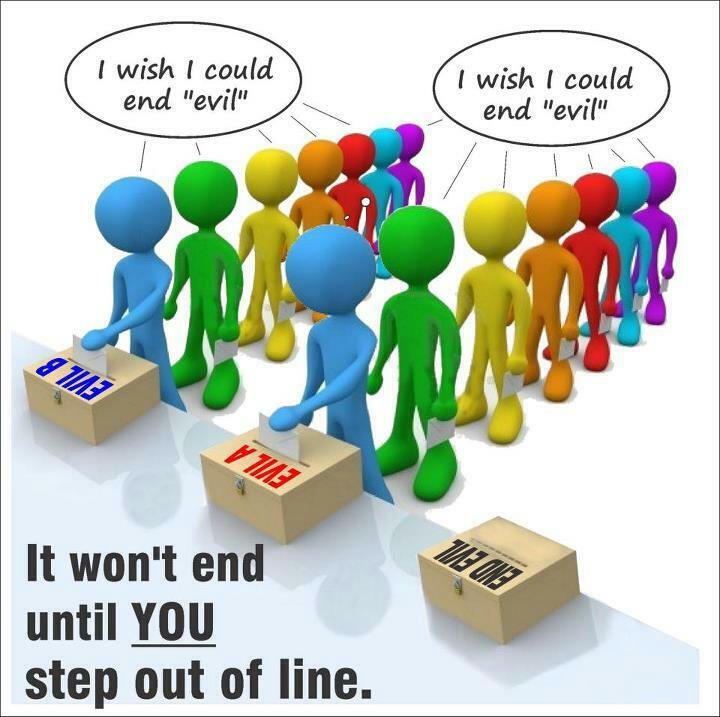 If any of you have a difficult time in getting your vote submitted, please email me at aaronsteckman@gmail.com to describe the problem you are facing and I will do my best to provide you with a written response that will walk you through the problem to make sure that your voices are all heard! Again, thank you all for your love, friendship and support and may God bless you and our great country! Step #1: Go the following website: dcoe.ideascale.com. Step #3: Click on the name of the idea (Tired? Overwhelmed?…). Click the up arrow to give a positive vote. This will take you to a registration page. 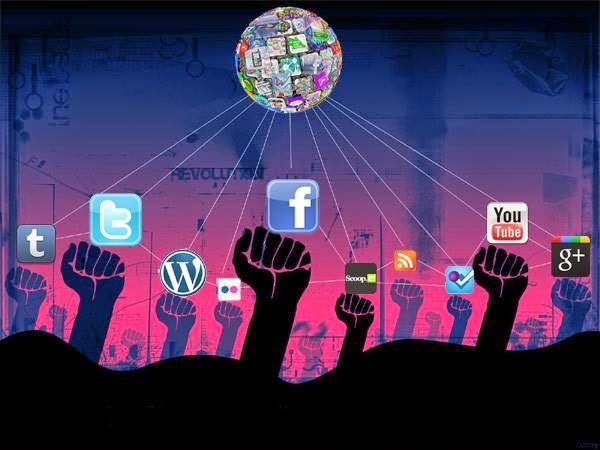 You can create a new log-in or use an existing social media account. Step #4: Fill in your name and answer the three required questions. Step #5: Click save changes. This will take you back to the DCOE website. Step #7: Click on up arrow again. At this point, you should see the vote number increase! Thanks for any help you can provide. There is 2 weeks left and ideas are getting posted all the time. 2. 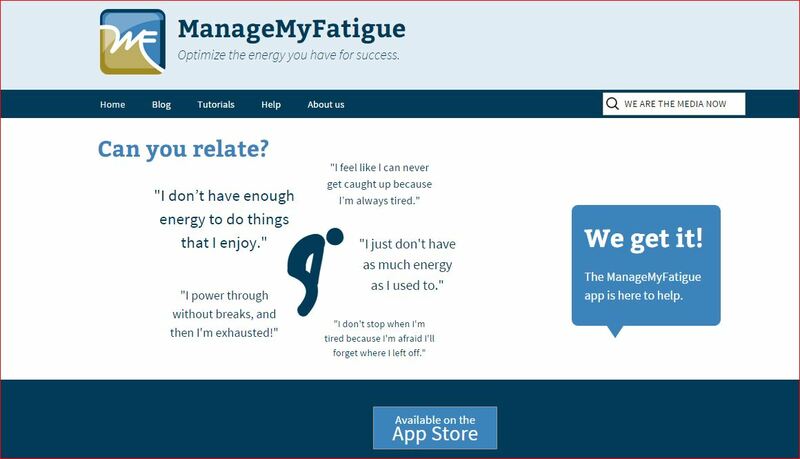 Scroll down on the website and click on ManageMyFatigue. 3. Where it says votes click on the up arrow. 4. Click on the Facebook logo on the right side of the website. 5. Enter your email and password for Facebook. 6. Click the Okay button when the pop up comes up. 7. Enter your name in the Name box. 8. Then click each tab that best describes your situation. …..appears to be a complete breach of fiduciary responsibilities and in what appears to be clear violations of California Labor Code exclusive remedy of workers compensation, a claim fraught with what appears to be egregious attorney and doctor and adjuster incompetence, malpractice ….and fraud, as defined by the Department of Industrial Relations…and California Civil and Labor Codes. 2015: more denials and more evaluations to prevent anticipated return to work. Tens of thousands of dollars have been spent by carrier on evaluations upon evaluations, with supplemental reports due to objections of omissions of more than 300 pages of medical evidence, with suspected intent to deny medical care, with failures to provide even the simplest requests since date of injury. CNA has submitted every request since February 2013 to UR, and Court intervention was required in 2013 to schedule authorized chiropractic and acupuncture sessions, which took many months. CNA has currently asserted that replacement of Orthopedic Surgeon PTP, who has reported MMI for Orthopedic Injuries as of December 2014, requires Utilization Review for a neurologist to become the primary treating physician. CNA seems to only have a small collection of evaluating neurologists, not treating doctors, and none current with brain injury practices of the 21st century; neither do they have physiatrists, neuro-psychologists, or anybody on their ‘lists’ that actually treat brain injuries, but they pay the evaluating doctors who provide reports prepared by non-medical personnel handsomely for their signatures on such reports, regardless of how flawed they are. 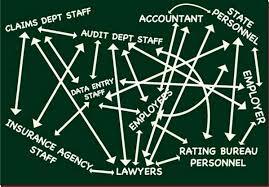 In fact, the greater the flaws, the greater the obfuscation, the longer the denials, the greater the billable hours. Most expert treatments have been abruptly and prematurely terminated due to threats to ‘cease and desist’ treatment by defense to providers and unlawful termination of disability benefits in what appears to be a pattern of continuous harm and financial terrorism by defense, as a pattern of practice, apparently approved of by WCAB and DIR and offices of the District Attorney. 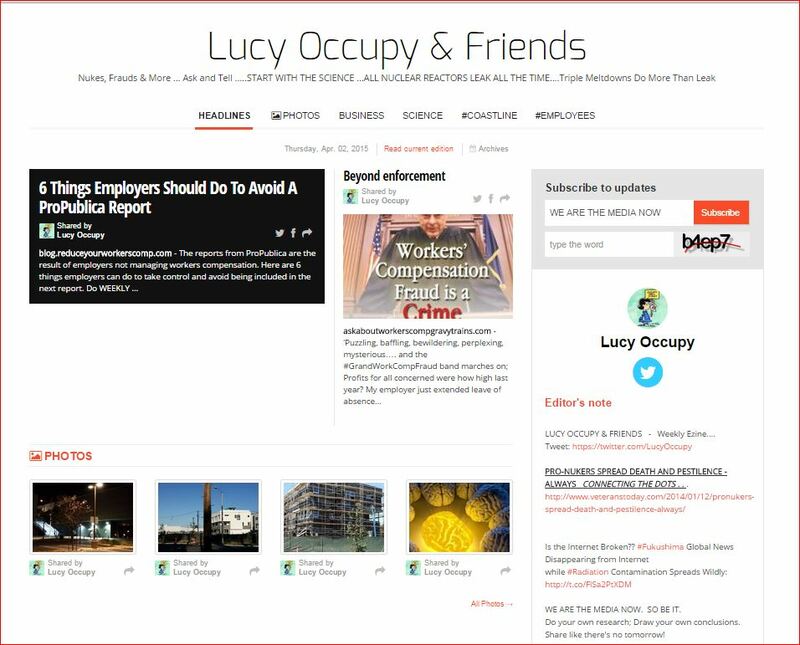 DOJ and EEOC investigations pending on multiple matters. 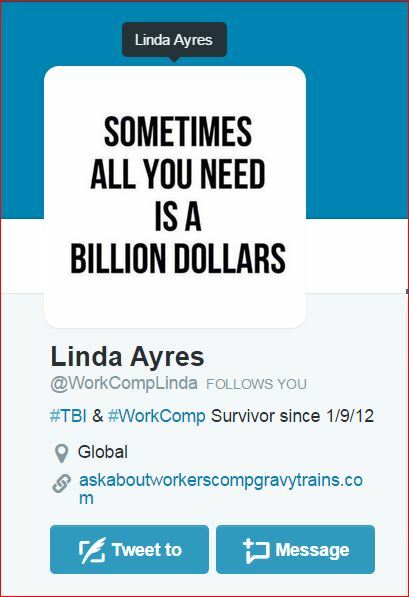 The BRAIN INJURED worker, seeking compensatory strategies for the brain injury… because restorative medical treatment was denied for more than three years… is now witness to legitimate business building condos week after week after week, while obtaining self-procured compensatory strategies in a one-to-year program at Coastline Acquired Brain Injury Program, the #1 program in the USA, and a part of the California Community College system, with experts in brain injury with more than 25 years experience each, helping people doctor’s did not reach, or that doctor’s gave up on for a variety of reasons. Best outcomes of interdisciplinary treatment systems are when utilized immediately and NOT the ‘3+ years or never’ post-injury as practiced by CNA and other major carriers; CNA provides and encourages only an Orthopedic Surgeon to allegedly manage an interdisciplinary team, then disrespects and disregards all recommendations and requests for specialty treatment and further evaluations because, as defense indicated repeatedly, ‘an orthopedic surgeon has no knowledge of brain injury’. At a court hearing in December 2012 a physiastrist or a neuro-psychologist or a neurologist was requested for treating doctor; denied and more recently, since previous PTP, Ortho Surgeon has determined MMI Orthopedically in December 2014, and has deferred to secondary doctor, a neuro-psychologist, a primary doctor has been requested in the field of neurology. Adjuster and defense advise that change of PTP requires UR. Designation of neuro-psychologist as secondary treating doctor required Court hearing as well. Churn churn churn. 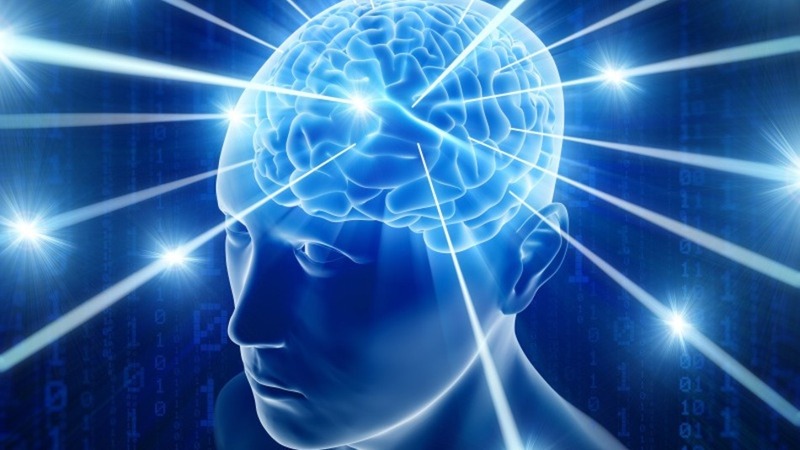 (In 2013, an industry leased neurologist was designated as ‘secondary treating doctor’ but alas, his office mis-read the authorization and deemed it to be a one time consult, determined nothing more than over the counter analgesics was required to treat the brain injury and related complaints and reports of vision and other issues; dates of injury were mis-stated by the doctor, along with other gross inacuracies. Then-counsel suggested injured worker take the concerns directly back to the doctor for corrections, and said doctor refused omitted records properly served, refused to answer questions his office required be put in writing, and actually threatened injured worker with a lawsuit for harassment for attempts to see this appointed ‘secondary treating physician’ and to correct gross misstatements in his reports and his supplemental reports, for which he billed handsomely. Similar story with the appointed AME Forensic psychiatrist, although he assertions in his supplemental report were more outrageous than what might have been called simple mistakes in his initial report. That scenario was repeated again by yet another evaluating/non-treating neurologists, complete with fabricated dates and deceptions. Goodness, what a trio lead by then-defense counsel misleading correspondence with apparent intent to deny medical care, quite successfully for years. Defense feels no obligation to pay estimated Permanent Disability, even on the orthopedic portions of the claim, nor do they anticipate the increased risk exposure due to their negligence and callous refusals to provide medically necessary treatments, as even recommended by their own leased doctors and evaluating firms. ACOEM, MTUS, NIH and generally cognizant neurologists keeping pace with the neurosciences generally recommend such treatments as speech therapy with cognitive rehabilitation, occupational therapy, physical therapies as required, vision therapies, acupuncture, chiropractic and specialty examinations by brain injury experts. Only a charlatan or worse would likely dare to recommend simply ‘over the counter analgesics’ for a well diagnosed closed head injury, called by more than 30 doctors by a variety of ICD-9 codes. While the Orthopedic Surgeon crowds are often designated as the Primary Treating Doctor for a head injury, their ilk are sadly ill-informed about diagnosing head injuries, and the urgency of getting patients to experts. 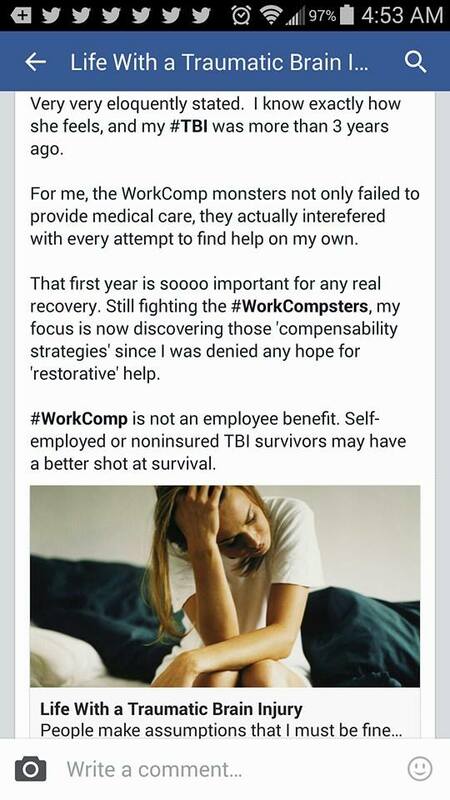 Until the Orthopedic crowd rises to their responsibilities in the life-threatening lapse in education of their peers, head injuries will continue to bring them small revenues as WorkComp ‘Primary Doctors’ and will ultimately bring them medical malpractices and charges for collusion to perpetrate fraud upon the disabled communities, for profit. Ask a Football Player. 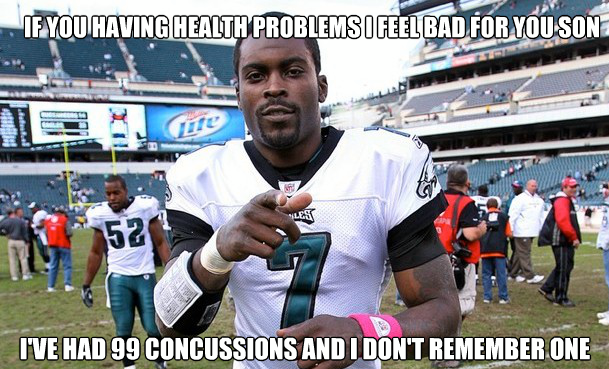 Ask a Retired Football Player. Ask a Veteran. Ask your kids. TO ENHANCE YOUR LEARNING ABOUT BRAINS? The GrandWorkCompFraud inhibits and prevents return to work for years by failures to provide medically necessary treatments. In this case, in April of 2012, upon confirmation of brain injury of unknown severity, the adjuster, not a medical person, terminated disability benefits and any hope of medical care in that month. A Court hearing in June of 2012 authorized a neuropsychologist to be the new designated primary doctor, although said doctor’s office was more than 3 hours from the injured worker’s home. [Ultimately, in 2014 CNA had to reimburse the State of California for the EDD monies advanced in the first 104 weeks for TTD, and CNA received a discount on the monies of approximately $16,000 from the State of California, which, as admitted by the adjuster, had the negotiation with the State not gone so well, that money would have indeed been paid/owed to the injured worker. The “TTD” [Temporarily Totally Disabled] condition was reiterated in every subsequent 45 day report in 2012 until the doctor (also with a QME designation) was also threatened by the defense, at which time, based on no medical evidence, nor treatment other than 4-delegated chat sessions with a psychologist of unknown credentials, at which time (October 2012) it was stated that return to work could be considered, with caveats, warnings, and accommodations, with allegations of continued authorized treatments, of which all his requested had been denied except the chat-sessions, discussed in more depth in earlier blogs. 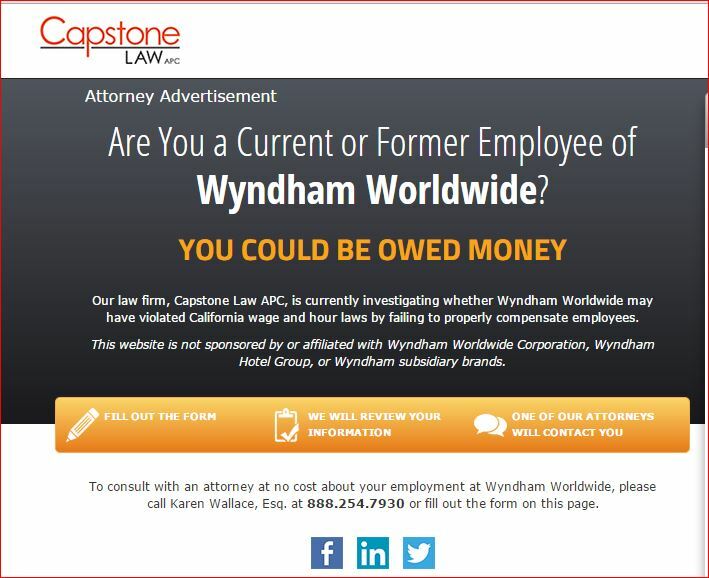 Wyndham refused repeatedly to engage in interactive process and simply extended leave and continued to refuse to investigate why injured worker was continuously denied medically necessary treatments, thereby complicit in the compounding harm to the injured worker. Wyndham continues to refuse to engage in interactive process, and refuses to intervene in more than 3 years of failures to provide medical care and disability benefits by that work comp carrier. 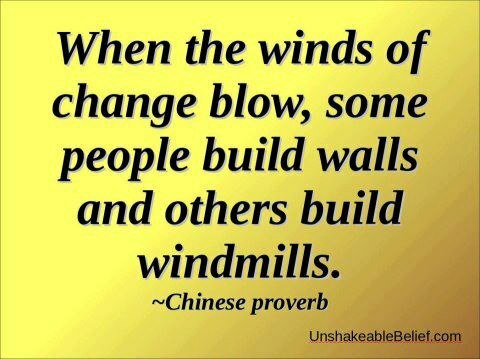 ARE THESE ACTIONS OF BUILDERS OR DESTROYERS? Friends or Enemies of Humanity? 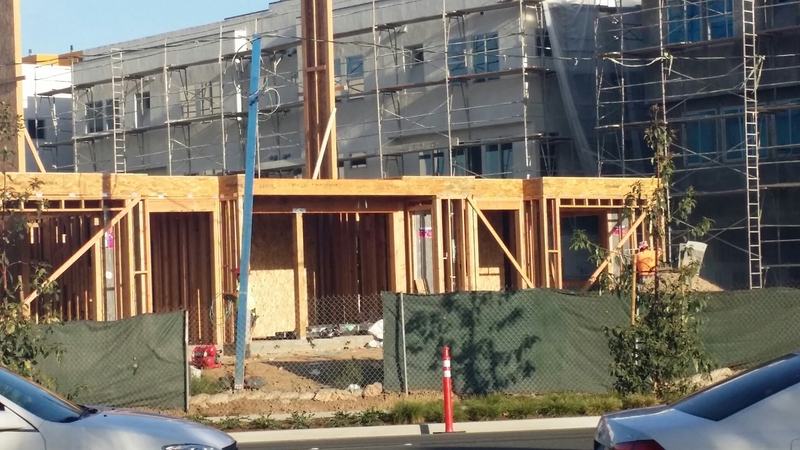 This photo shows the progress of a condo development being observed and enjoyed by the injured worker, a real broker who lost all professional credentials, including CA real estate broker license, CA Notary license, Hawaii real estate sales license, and was threatened with loss of CA Driver’s license. During her weekly pursuits at regaining her life while attending the Coastline acquired brain injury program, since October 2014, with no thanks to CNA, and with thanks to Wyndham for an employee discount at a local hotel, watching the construction of this and other signs of economic good stuff has been smile evoking. 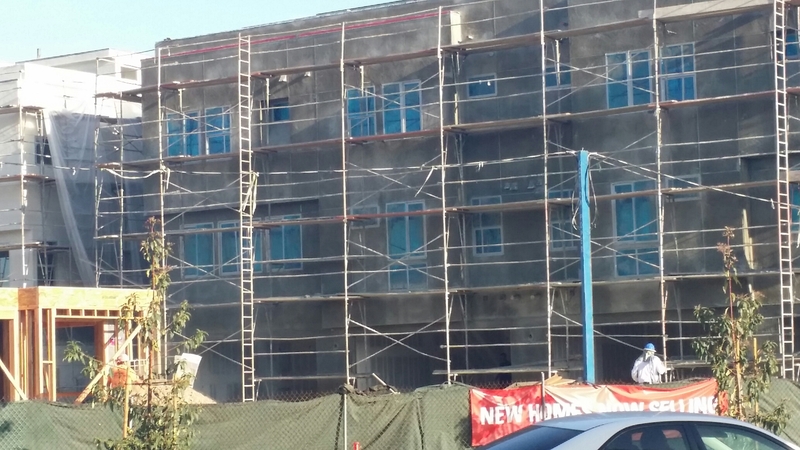 Down the hill and to the north, Huntington Beach also has multi-unit ocean view properties under construction. 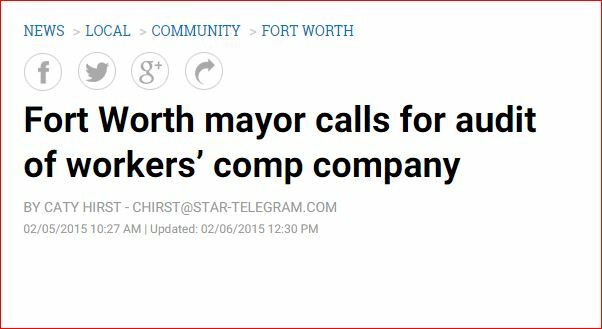 What an ‘Exclusive Remedy’…Employee insurance with CIGNA, without interference by CNA and Grancell, could have had the injured back at work, possibly, within months of the injury, similar to building a condo from a hole in the ground. 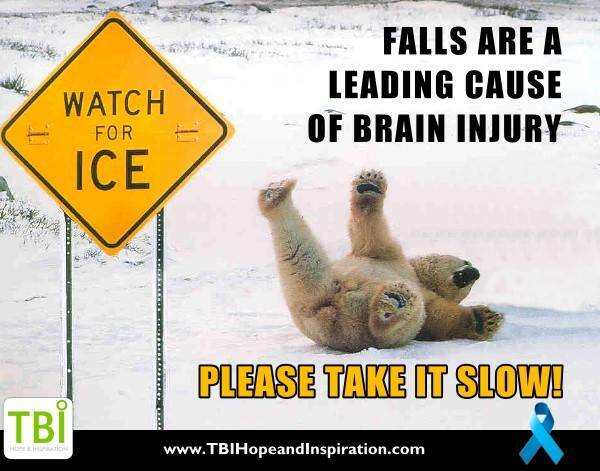 MEDICAL CARE PROVIDED TO DATE BY CNA FOR HEAD INJURIES OF 1/9/12…..A WITNESSED SLIP AND FALL BACKWARDS ON ICE? 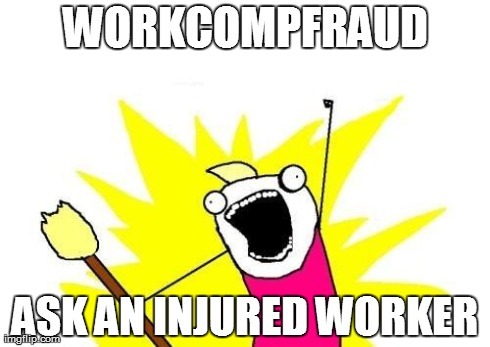 WorkComp is certainly the #GrandWorkCompFraud perpetuated on the Unsuspecting Public! What a shame! 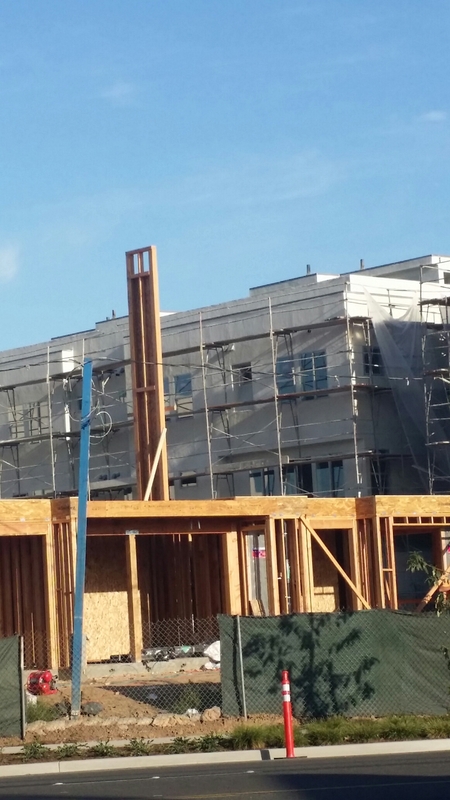 Contractors can build multi-unit residential buildings faster than a WorkComp carrier like CNA can authorize medically necessary treatment for a witnessed slip and fall backwards on ice. Why would a corporation like Wyndham Worldwide pay a corporation like CNA to maim and injure it’s labor force, without batting an eye, or lifting a finger to ask more questions. Are Board Members really involved with conflicts of interest in the insurance industry? Does the Wyndham Risk Management division have unclean hands? True defenders of Justness and Justice seem real hard to find in America…. 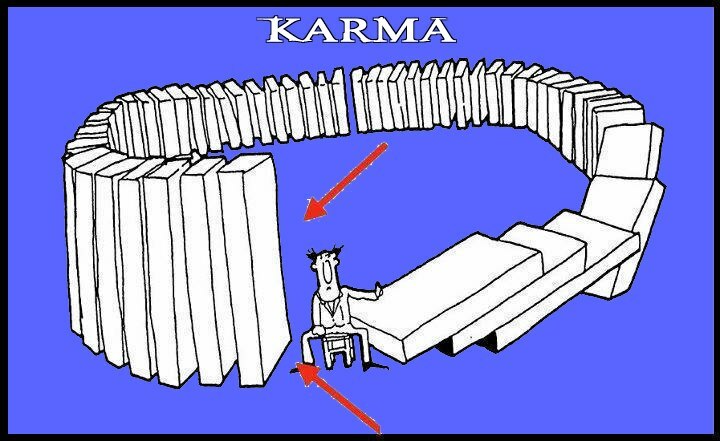 Isn’t it amazing to be able to witness not only the good in America… But having the courage to expose the evil, the corrupt and the dangerous… Workers compensation is not an employee benefit.Sadly, the silence of the employer appears to be criminal complicity in the egregious wrongs done to this and other Wyndham employees. What say you America?Isn’t it time to hold the criminals accountable for the continuous patterns and practice of harm to injured workers across the nation? Ask more questions! If not you then who? If not now then when? LET IT IMPLODE; BUILD SOMETHING ELSE. 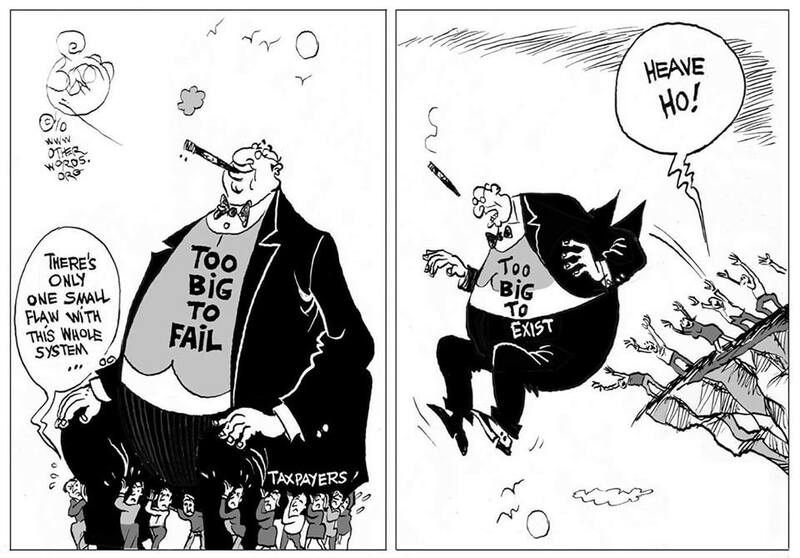 THE INSIDIOUS SYSTEMIC FRAUD OF THE CURRENT SYSTEM IS NOT SALVAGEABLE. BRING IN THE WRECKING BALLS! TIDY UP SOME DEATH ROW JAIL CELLS IN SOME OF THOSE PRIVATIZED PRISONS FOR THOSE FOUND GUILTY OF CRIMES AGAINST HUMANITY. IF AMERICA CLEANS UP IT’S CORRUPT WORK COMP SYSTEM, PERHAPS WE CAN THEN BE OF ASSISTANCE TO CANADA, THE UK, JAPAN AND ELSEWHERE. Remember remember, Thomas Motamed, CEO of CNA ‘made’ $10.7 million in ‘earnings’ in 2014…. and they can’t even pay simple TTD to an injured California worker in compliance with the law, and they terminate benefits on diagnosis of a brain injury, and even call to ask injured worker, “……so tell me, Linda, when ARE you going to die?….” Defense counsel suggests a court appointed conservator as he trolls for someone/something to blame from medical records of more than a quarter century ago looking for pre-existing conditions, apparently to support grossly inaccurate reports of three of their industry leased own reporters. Isn’t it funny how few QME/AME actual doctors write those reports? One such doctor openly admitted that his non-medical staff was ‘well trained’ to write such reports that he freely signs, and is paid handsomely for initial reports and supplemental reports, regardless of acurracy of apparently fraudulent intent. Hmph. Tired of Fighting #Workcompsters– Will you take it from here for a while? In an attempt to minimize the continuing harm caused to me by many unclean hands in this WorkComp case, I am respectfully submitting ADA Accommodations for the upcoming Status Conference Hearing in your Court, scheduled for my birthday, April 8, 2015 at 8:30 am. Will you kindly move the date to a Friday, or a Thursday, to minimize the continuous harm to this injured worker, and will you kindly ensure that the requested ADA accommodations are honored. I have never been heard by a Judge regarding my violated rights to immediate, reasonable and appropriate medical care. Date of head injury, 1/9/12. 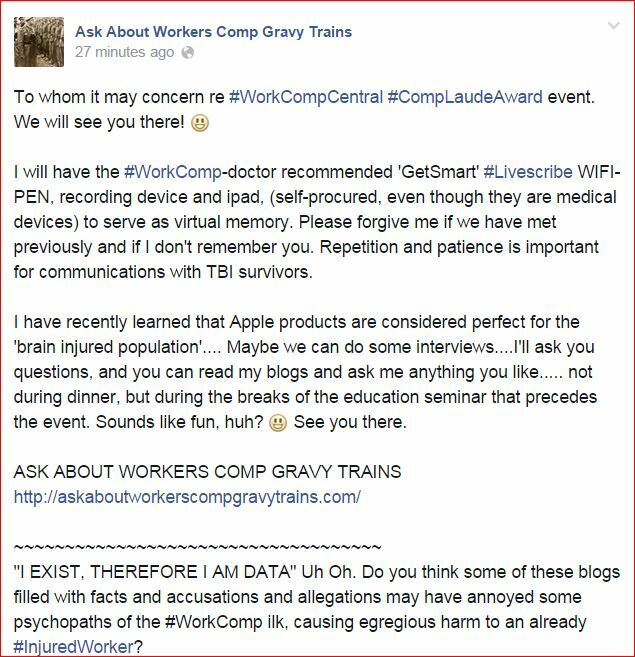 I have an untreated Brain Injury and I am surviving Workers Comp to the best of my abilities and I believe Congress needs to initiate #Domestic Torture Reports for the conduct of those running WorkComp in America. By copy, I am asking for help on these complicated matters from Senator Jean Fuller, Deputy District Attorney Jennifer Lentz Snyder, the Employer Fraud Task Force, and the investigative journalists at ProPublica, and the world at large. 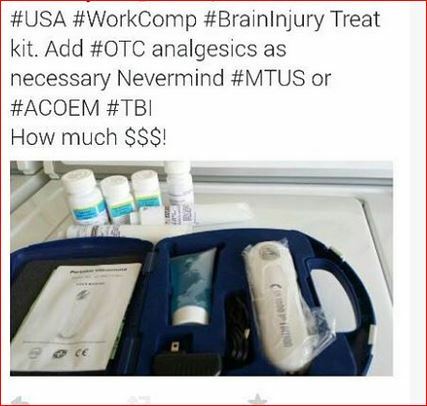 “Over the Counter Analgesics” recommended by WorkComp doctors for Traumatic Brain Injury? 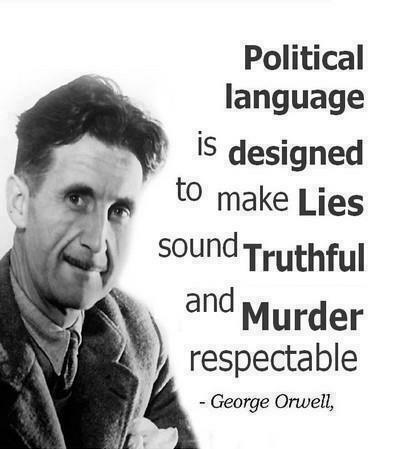 Defense repeatedly omits approximately 300 pages of medical records with intent and success to deny medical care, without consequences to anybody but injured worker, and to the profit if the defense firm and industry doctors? Another doctor alleges there was no witnessed slip and fall, and if there had been, of course, medical treatment must be provided, but it was probably epilepsy. Three industry doctors falsely stated the date of injury in their reports as “1/9/1 3“, and used medical evidence of 201 2 to support pre-existing conditions. When brought to their attention, they simply changed the date of injury reference, and made no changes to false conclusions, all with intent and success in denying medically necessary treatment for over three years. 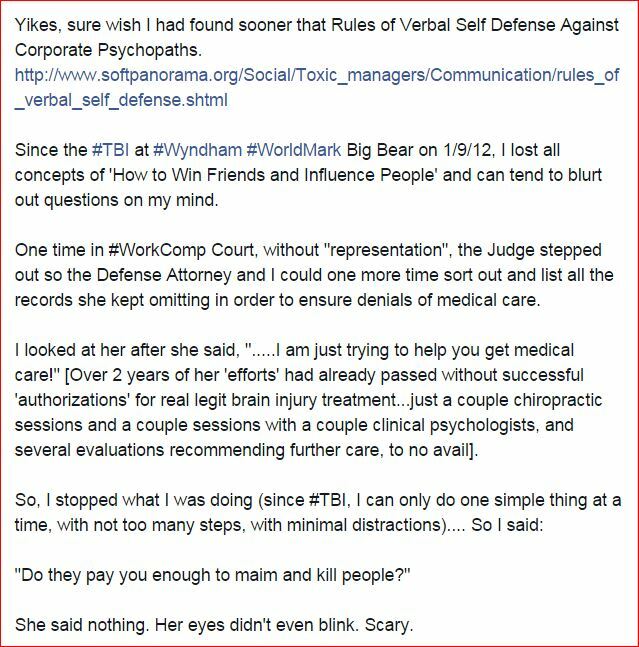 They (Defense and my then-counsel) attempted to coerce me to accept a $100,000 settlement, less attorney fees, in November 2012, without the requested evaluations and treatment that first year, less attorney fees, and required resignation from my job, and a promise to not file for social security disability for at least 3 years. The representing attorney told me, “Work Comp is a very small community, everybody knows everybody. If you don’t take this, you’ll get nothing. Nobody will believe you have a brain injury.” I told him that’s because he didn’t get me to any of the recommended doctors, nor get me any of the recommended treatments, and that I am injured, not stupid. Defense and I & A Officer reiterate that “it’s a small community, everybody knows everybody”. What does that sound like to you? I think the DOJ should find it of interest, don’t you? Your honor, I think there should be some investigations and arrests regarding my case, don’t you? While Valerie James, Riverside I & A officer, not known for compliance with ADA law, advised me on the phone today that requesting a change of date so that I do not miss time from the State run Acquired Brain Injury Program at Coastline Community College “is not an ADA request” I will seek further counsel there. 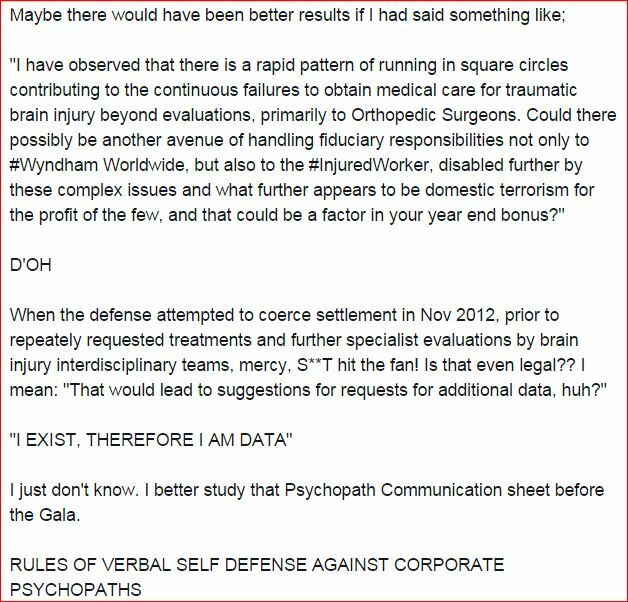 It seems to fall under the category of reasonable requests, particularly since I have to travel over 100 miles to get to the program, pay for a hotel room, and eat meals out in order to obtain help for compensatory strategies to deal with the untreated brain injury of 1/9/12 and consequent second impact trauma of 2/4/12 and a more recent injury, related to the initial injury, of 12/3/14. In order to be present for further Defense file churning and use of Court time, I will have to miss a full day of compensatory strategies by leading brain experts, I will have to repack from a Newport Beach Hotel and find a Riverside hotel, unpack, pack again, show up at Court, listen to Defense continued chicaneries, then drive back to Newport Beach for the final day of the program, on a Thursday. While to someone without a brain injury, that sounds like “no big deal”….. for someone with cognitive impairments, slow processing, auditory and visual impairments, it is close to a devasting demand. It took me two years to get in front of a Judge at WCAB to be heard for my right to medical care, denied now more than 3 years, with the help of the Information and Assistance Officer. At one hearing, when I requested auditory aids, not only did she deny them, she confiscated my cell phone and the recording devices I had brought to make it an easy request. At the last hearing, in July of 2013, it was an extended continued hearing, and when I arrived, there were none of the accommodations requested. In fact, I had to be addressed by the Judge, in a Court room of lawyers, with all my paperwork sitting in my briefcase, behind the Judge’s chair. I was not allowed access to the papers and I don’t even recall much other than the horrors of such a violation. The Judge told me that issues of fraud are not addressed in his Court and that if I had such allegations, I was required to verbalize my concerns. 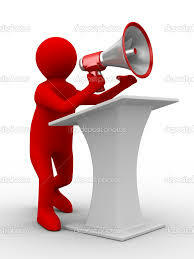 I HAVE A BRAIN INJURY, WITH SPEECH, VISION AND AUDITORY IMPAIRMENTS. I asked then for a postponement so that I could find a government agency to help me address my concerns of felony fraud that permeate my case, and I assured the Judge I had no intention of returning to his Court until such time. 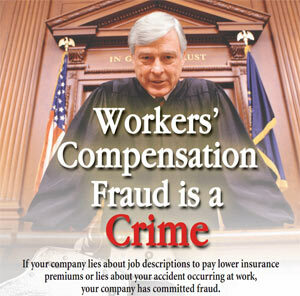 Sadly, I have learned that Fraud is a non-prosecuted pattern and practice in the world of Workers Comp. I have been denied disability benefits, medical benefits, and I have been harassed, discriminated against, bullied and more since this injury, and much of it has happened with WCAB Riverside knowledge, and in some instances, participation. Does it make sense to have an Orthopedic Surgeon, who fully admits he has no knowledge of brain injuries, as the designated primary treating physician since 2/15/13, and to have every one of his requests for specialty evaluations and treatments denied denied denied? Originally, when he was designated, Ms. Mall of the defense, and Ms. James of your offices, assured me that I could not have a Phsyiatrist or Neurologist of Neuro-psychologist as the treating doctor, but the orthopedic surgeon could as for such. After months and months of denials, defense firm said the requests were denied since the orthopedic surgeon had no brain injury expertise. 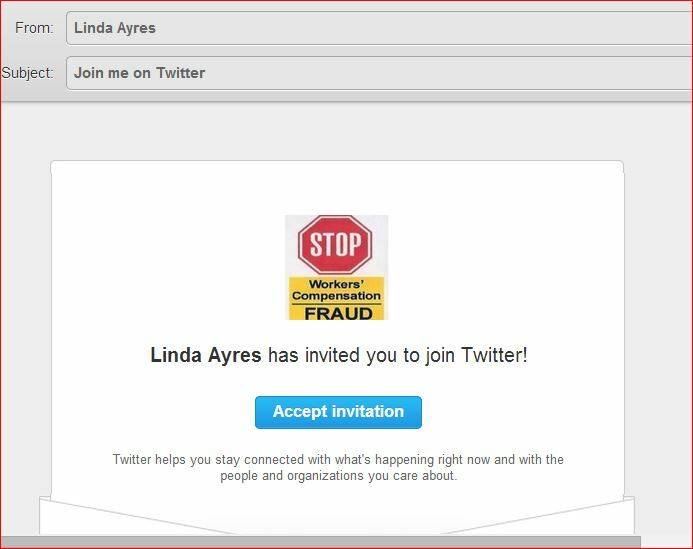 What a “Grand WorkComp Fraud” I have been victimized by. 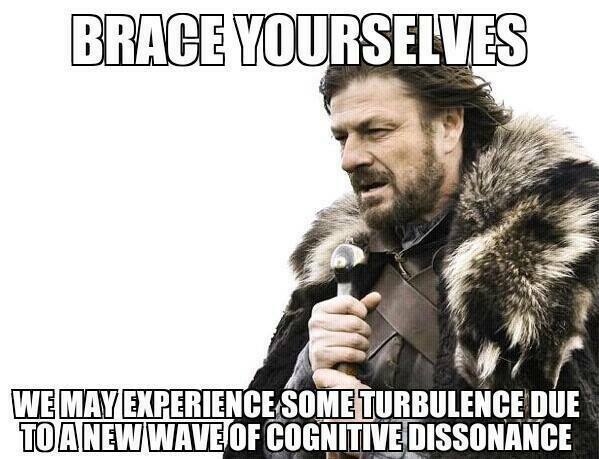 Now, they want yet another battery of Neuro-psych tests…. although they ignored the results and failed to provide requests for treatment by doctors since 2012 — Dr. DeGoede – Clinical Psychologist referred by EAP, Dr. Eileen Kang – Neuro-psychologist, referred by Dr. DeGoede since CNA had no neurologists or neuro-psychologists to refer to, then a Dr. Marcel Ponton – QME, Neuro-psychologist, Dr. Lynn Lowell, Neuro-Optometrist, Dr.Eric Ikeda, Neuro-Optomestrist, Dr. Michael Lobatz, neurologist, , ScRIPPs Brain Injury Rehabilitation Center and approximatley 34 doctors, all paid for expensive evaluations, while I have been denied medically necessary treatments since date of Injury. I have spent more than $30,000 out of pocket to survive work comp, and this recent phone call with Ms. James tells me nothing has changed. She is not an impartial Information and Assistance Officer. While Stewart Reubens, Esq. advised you that “Ms. Ayres has been evaluated by a psychiatric Agreed Medical Evaluation, Dr. O’Brien, an orthopedic QME, Dr. Holmes, and a neurologic QME, Dr. Kent. Currently Ms. Ayres is treating with Dr. Chalgujian, a neuropsychologist. She is also treating with Dr. Darren Bergey.” What he didn’t tell you is that Dr. Darren Bergey is an Orthopedic Surgeon, with no knowledge of Brain Injuries, who requested valiantly medically necessary evaluations and treatments while he was the PTP, February 14, 2013 thorough December 2014. Over the course, he obtained authorization for an MRI of my right shoulder, and upon diagnosis of a severe tear and injury, he was told to change his records to indicate that the right should was non-industrial. His MMI for orthopedic supported that lie. Apparently, the carrier or defense had threatened his office financially, by threatening to terminate referrals if he a) continued to request brain injury treatment and b) did not change the right shoulder to non-industrial. He cancelled my December 2014 appointment, and said I am MMI – orthopedically, and still 100% TTD from the brain injury. Mr. Reubens also neglected to mention to you that the O’Brien, and Kent reports were an expensive disorganized mess, due to his collegue, Kim Mall, and her little pattern of practice to omit medical records (hundreds of pages!) with clear intent to deny medical care. Those three doctors seems to have been working directly for Ms. Mall, and when it was brought to their attention that they had mis-stated the date of injury as 2013, and that they were using 2012 medical records as false evidence to deny medical care, they simply changed the date in their supplemental reports, but NOT the conclusions. 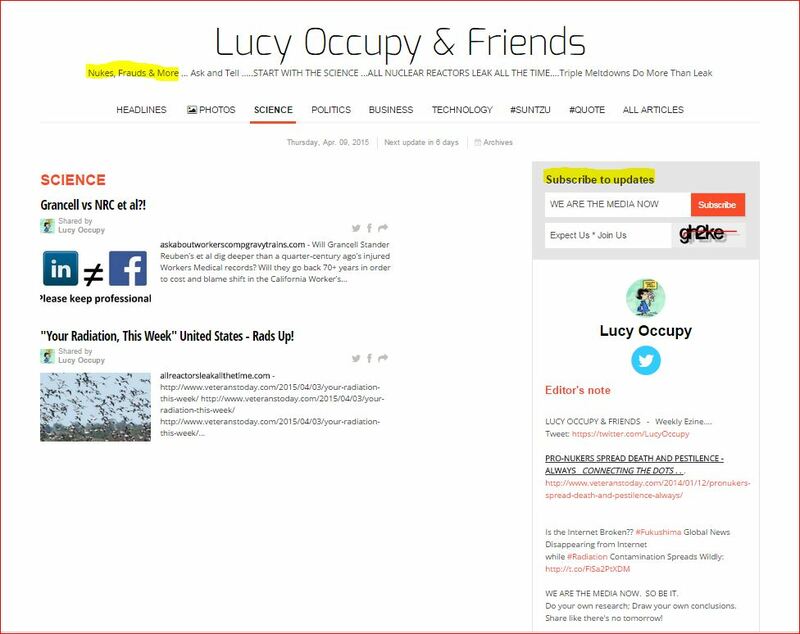 That does seem to meet the DIR defintions of felony fraud, but alas, this is WorkComp…. with secret medical records (yes, Ms. Mall attempted to continue to use the Dr Obrien report and asked evaluating doctors to consider but NOT summarize it. I’m not a lawyer, but that seems to be a breach of Article… XIV of the California Constitution, and the 14th Amendment of the US Constitution. 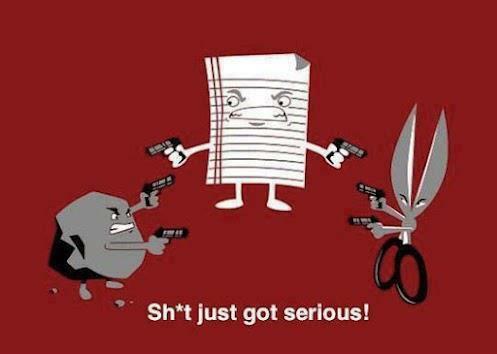 Alas, it’s work comp….. nobody seems to have jurisdiction over such wrong doings. Stewart Reubens, in further acts of ADA and EEOC violations, even suggested that I should consider a Conservator, since I am unable to protect myself from the WorkComp chicanery. I have repeatedly requested electronic communications due to my brain impairments, and Kim Mall and Stewart Reubens have repeatedly abused deadlines by sending things regular mail. Perseverance and tangential communications are part of the brain injury, and I am working very hard on learning compensatory skills to hopeful build a life again, after these monsters refused to provide medical care for over 3 years, and the first two years, I could not even leave the house except to get to their demanded evaluations. I would appreciate a change of date for the hearing, and I would also ask you to kindly ask the Defense exactly WHAT TREATMENTS WERE PROVIDED SINCE THE DATE OF INJURY, and were they in compliance with ACOEM guidelines. If you are unable or unwilling to change the hearing date, kindly ensure that my ADA accommodations are honored. I will bring the nearly 1,500 pages of medical evidence, and CorVel denials that appear to have supplemented CNA hand-washing. With all due respect, I have been terrorized by this system far too long and I will seek intervention from the Fraud Unit at the District Attorney’s office, and hope that they will sent a witness to accompany me to the Workers Comp offices for the hearing, on whatever date you demand. This letter will also be a part of my social media records. I would hope that you would encourage investigation of this case, from top all the way to Sacramento. It appears to be real dirty. Perhaps the investigative journalists at ProPublica and NPR could take a look and provide some direction. 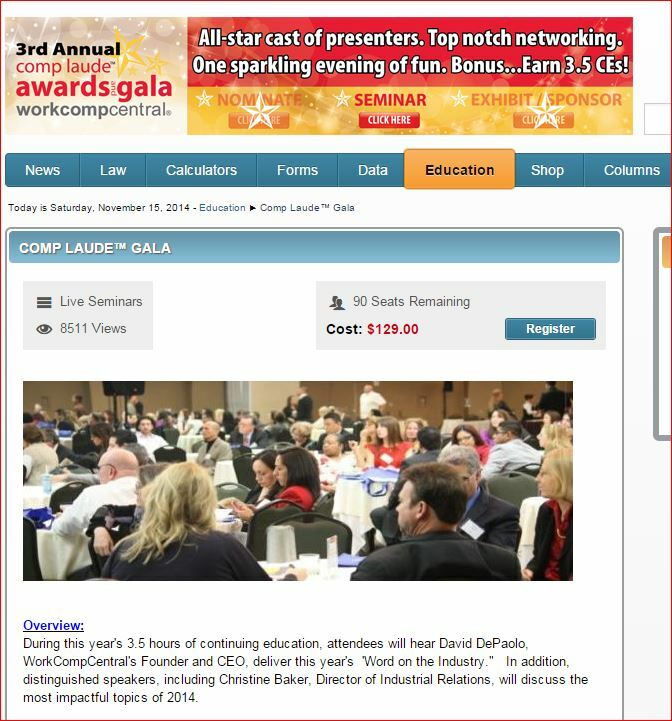 Several work comp expert bloggers have written about my case, with concerns. 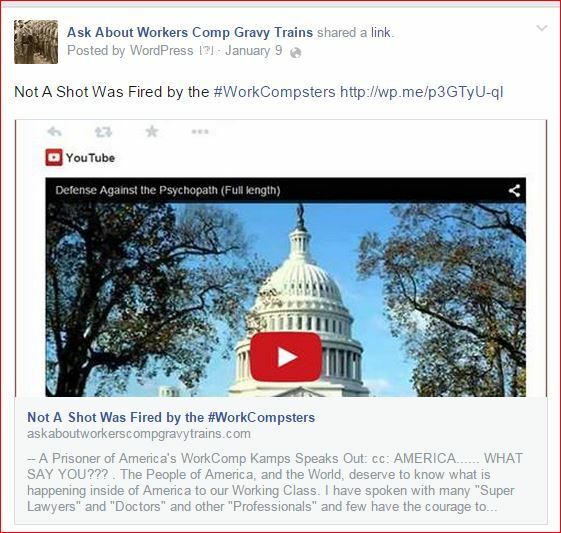 My blog, if you have an interest, is ASK ABOUT WORKERS COMPENSATION GRAVY TRAINS https://askaboutworkerscompgravytrains.com/ …. 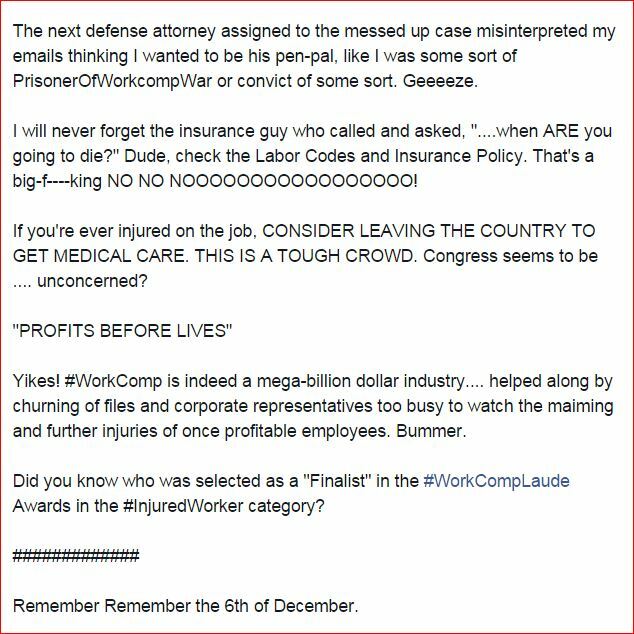 all the grim details are there….. it’s a crying shame that such things happen in America, in “roughly 80% of work comp cases”. Attachments (2): Accommodations Requests for Persons with Disabilities 1 of 1 – Change date of hearing; 2 of 2 Reasonable accommodations including quiet room, large table, recording, laptop, support chair and breaks at least every 50 minutes. 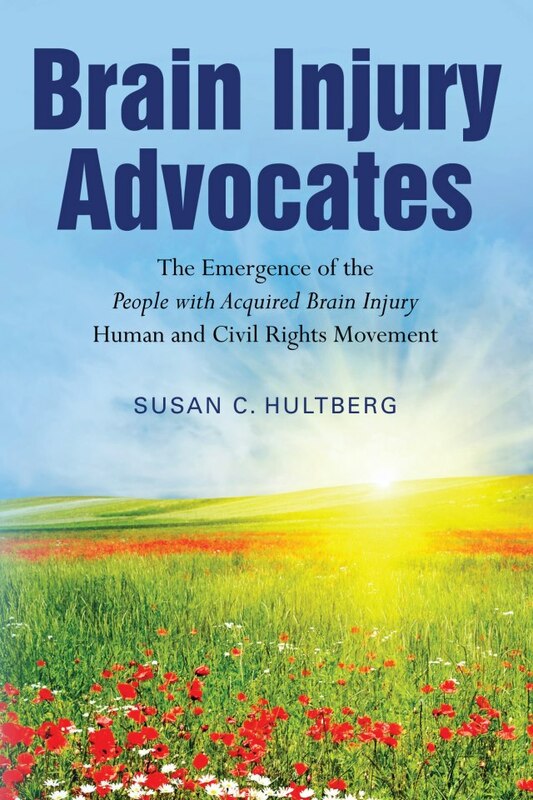 PS Anybody else wonder why federally mandated, grant funded DISABILITY RIGHTS CALIFORNIA’s PATBI PROGRAM, Protection & Advocacy for Individuals with Traumatic Brain Injury program EXCLUDES INJURED WORKERS? CAAA looks the other way. So far, the offices of the DA have the looked the other way. 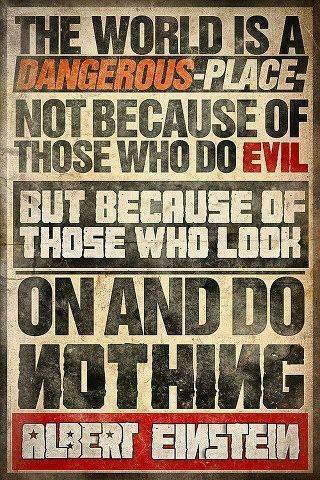 DIR and EEOC refer back and forth to one another… My My….. Ain’t it a crying shame. 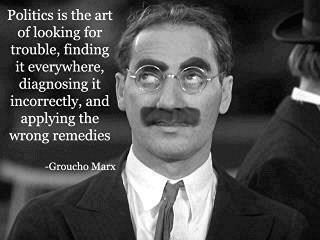 Is that more of the #GrandWorkCompFraud and Exclusive Remedies deal? I am not carbon copying anybody other than Mr. Zachs. I will object to any request for postponement or additional delays on your part. Afterthought response…… you didn’t send them electronically, as repeatedly requested as an ADA accommodation? Yikes. I wonder where they are? 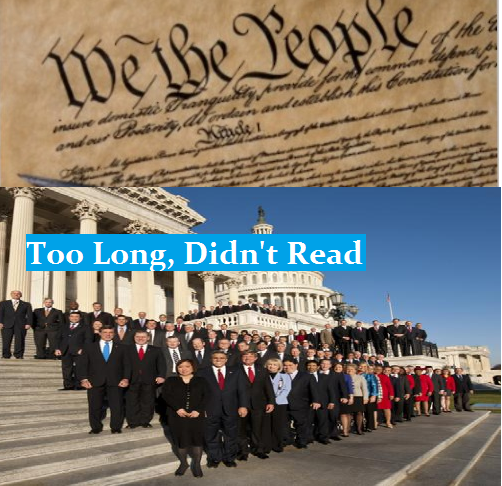 I got all sorts of other legal mumbo jumbo Thursday…. and I still have to submit another appeal to those CorVel WorkCompsters on yet another set of ‘non-recommendations’ based on omitted medical records and their fake reports from earlier fake reports…. Geeeeze, how do they do it? I also have more requests for medical miles from last year, and must get copies of the recent fall ambulance and ER room bills to Fred, and I’m supposed to be learning cognitive ‘compensatory strategies’ and I ASKED YOU NICELY TO LEAVE ME ALONE TILL AT LEAST JUNE, SINCE YOU HAVE PAID ANY TEMPORARY TOTAL DISABILITY BENEFITS SINCE MAY OF LAST YEAR…..and the local crisis center Social Worker isn’t coming back till the end of the week. Where oh where can that new pile of your file churning stuff be? No, that’s medical records for Social Security, due last December. Maybe here? Naw, that’s time sensitive stuff that needs to get done….I just got those folders so I can see things; with the visual impairments, if I can’t see it, I forget about it. At Coastline, they say I need visual cues, but that I prefer auditory input for best processing, however, the auditory evaluation indicated that with frontal lobe deficits, cognitive processing is impaired by what I hear, so I must have visual cues….that also makes phone conversations hard… Maybe whatever you’re talking about is in this pile? 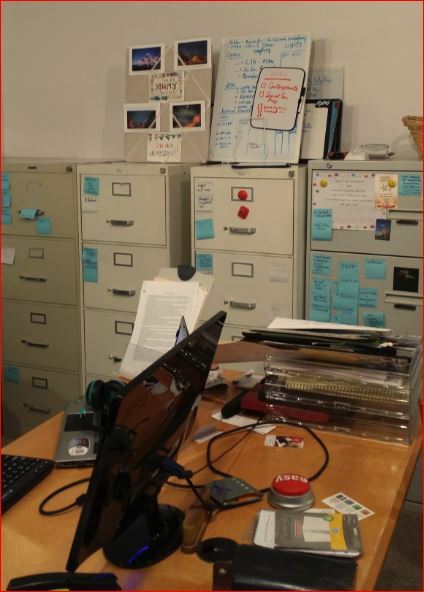 Nawww, the cabinets have mostly research stuff about omitted medical records, fraud complaints, legal compliants, legal self-help, doctor reports, and the white boards are not working as they should…. 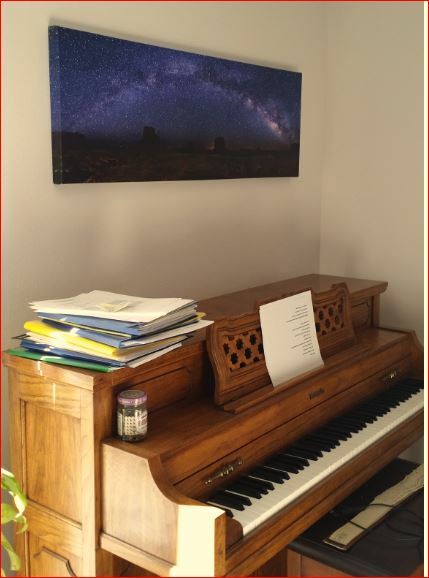 low tech, high tech….. what difference does it make when there’s a brain injury, huh? Maybe it’s in the car? Why don’t you send it again, electronically, then at least I can know what I’m looking for in hard copy. Thanks. Your copy. Do you want to ask for a postponement till after June for Court petition for file churning hearing or shall I? Let me and Fred and Shane know. Happy New Year to you, too. I’m so grateful I can write and say nice things about Matrix/Reliance, and particularly you and Stephen Buchs. Thank you, from me, and on behalf of other Wyndham employees. 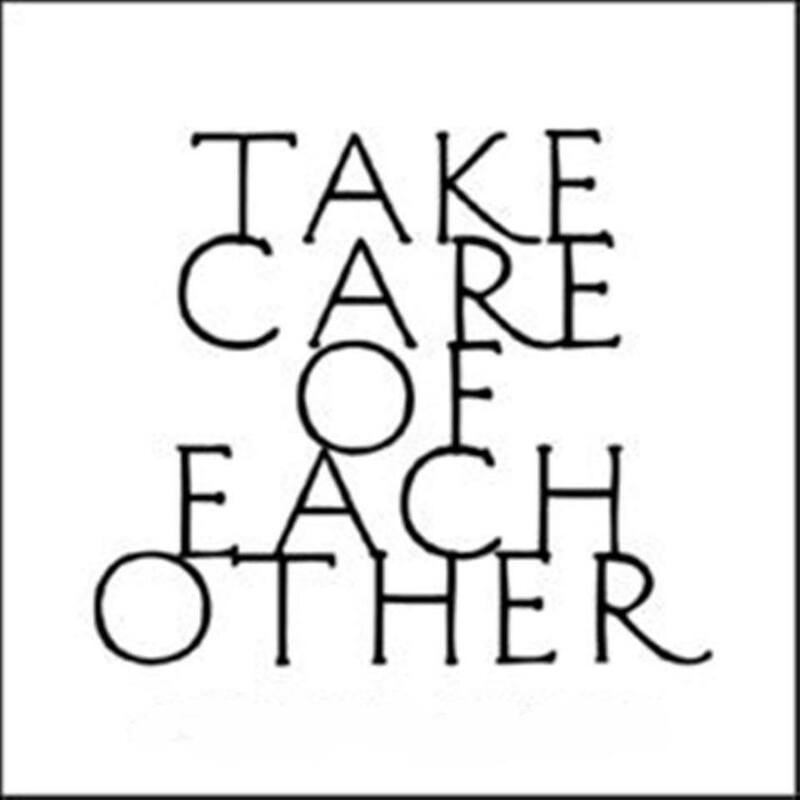 At least one of the insurance providers honors fiduciary responsiblities. This is a little long to bring some of the recipients also up to speed. The bottom line for you is, can you put my disability payments on auto-payment. I think you know the rest of the content. I understand you are handling my claim again, so here is an updated progress report from Dr. Hilda Chalgujian, now the primary treating doctor, a neuro-psychologist, since the Orthopedic Surgeon now says he can’t do anything about getting brain treatment, as evidenced in 2 years of asking, so he has deferred to Dr. Hilda and apparently washed his hands of my case, as evidenced by cancelled December appointment. I just received Dr. Hilda’s report, dated 2/6/15; it is attached. I have also requested an extension of the leave of absence from Wyndham until December 1, 2015. If I can get back to work before then, I’m doing all I can to make it happen, despite the terrorism of the defense firm. Remember, the first neuro-psychologist, Dr. Kang, in February 2012, referred by Dr. DeGoede, Clinical Psychologist, referred by CIGNA EAP program, who intially referred to Dr. Esmael Septi, Neurologist, who was on the alleged MPN list, but refused to see me when I appeared for appointment in February 2012, then his office perjured when it said I failed to appear. Anyway, Dr. Kang said that with Speech Therapy with Cognitive Remediation, I would likely have been back to work in months…in 2012. Then the attorney moved me to Dr. Marcel Ponton, also a clinical psychologist, in April 2012. Dr. Kang thought it was just for a second opinion and that she was continuing to treat me. She was surprised to learn last year when I contacted her that I still had not received Speech Therapy, or any of the medically necessary treatment Dr. Ponton had requested, such as vision therapy, neuro-evaluations, EEG neuro-feedback and more. What a fiasco. 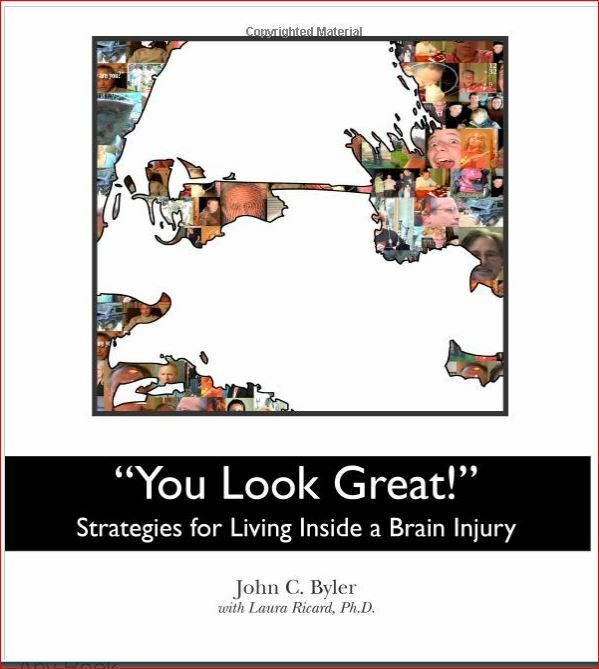 Here is an excellent article about TBI, and the first year. It’s going viral. My comments may already be buried since they were of the first ones. Send it to your Human Resources and Risk Management Corporate Peeps! Amy is just at the one year marker, and therefore has a shot at some recovery, and restorative treatments. If I didn’t have to fight workers comp, I might be better too. Dr. Hilda’s comments in her report on what fighting does to me/for me are …. alarming. CNA’s failures to treat denied me any recovery there, so now all I can hope for is “compensatory strategies’ to deal with the devasting injuries. Hmph. All they had to do was give me some of the requested medical care, but they couldn’t do that. 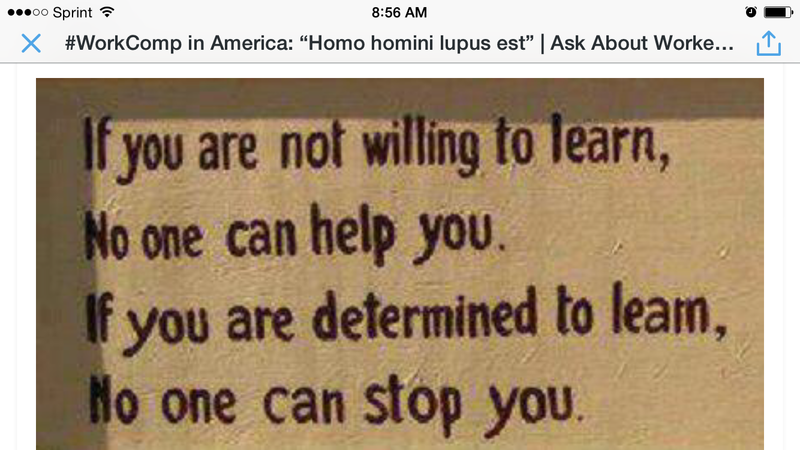 They couldn’t follow the ACOEM/MTUS/NIH guidelines. My loss. Can you set up automatic deposit for my disability payments? I am staying in a hotel (a Wyndham property, kindly at a discounted rate by Wyndham Human Resources) so that I can attend the Coastline Acquired Brain Injury Program 3-4 nites a week. As you know, I have to pay for it, as I have had to pay for most all the medically necessary treatment I have received to date. I can’t rent a place yet, since it looks like the insurance carrier’s defense firm is up to more no good. I have been advised by others to not sign a lease, even a six months lease, to make it cognitively easier to be at the Coastline program. I have a social security hearing scheduled (I will have to miss program time one or two days to facilitate that) but assuming they finally approve my claim, I will then have the money to continue the Coastline program through December. I am also seeking financial aid to make it possible, and also scholarship money. It seems to be my only hope left. 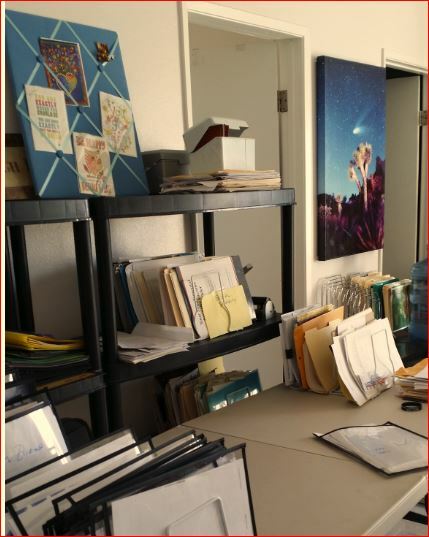 I’m really struggling with organizing the medical records to submit, and the Crisis Center Social Worker may come and help me again Friday; I hope so. She couldn’t make it last week. The WorkComp defense carrier is continuing with legal chicanery and what I call ‘terrorism and bullying’, and are pulling me into Court on 4/8/15 (my birthday, also causing missing Coastline program time to see if a Judge will support their chicanery; I had asked them to postpone till at least June to let me be at Coastline without their terrorism, but no, they can’t do that. I willl ask the Judge for a postponement, even if it requires a note from the District Attorney. It seems to me that CNA could simply have someone competent review the reports of prior neuro-pscyhologists and see what remains to be done before requesting a Judge to compel. 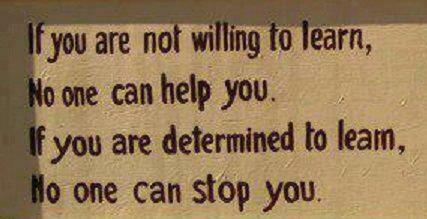 I am fighting still their denials to provide medically necessary treatment. 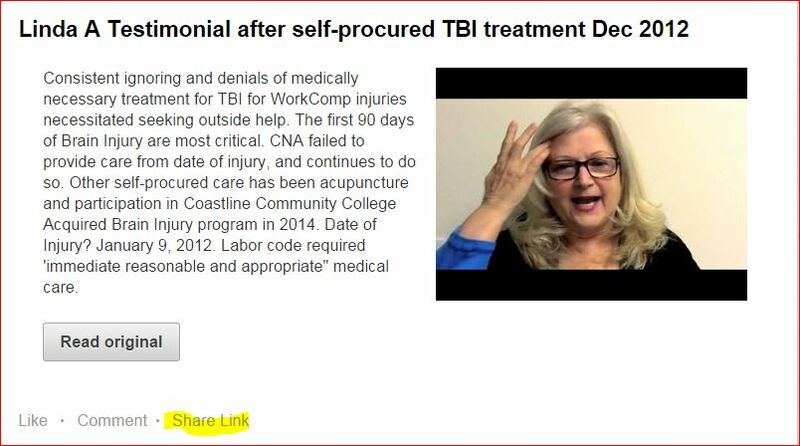 Nobody will say CNA has done right by first/second year treatment of chiropractic and clinical psychology, and 6 physical therapy treatments, and in 2014, some speech, occupational and more pt for clearly diagnosed brain injuries. ACOEM/MTUS/NIH have a far different criteria for treating brain injury than does CNA, hence, I have been off work more than 3 years. Monsters. I believe CNA or their Defense Carrier is requesting records from you. I am requesting also that this current narrative report from Dr. Chalgujian be included. I am overwhelmed by all the legal stuff I received Thursday, with more chicanery from that CorVel company, under investigations in Texas for their abuse of injured workers. I hope California will follow suit. They simply follow the directions of the adjuster, as I have been told directly, even though I represent myself in pro per. They do nothing without adjuster approval, according to one of their supervisors. They have also violated my HIPPA and ADA rights. Not your problem, but if they are requesting anything from you, you need to know who/what they are. Many thanks. Please let me know about the auto-deposit and any forms you need me to sign. Thanks Steve. I promise to do my best not to be a bother. I have even called my favorite prayer line and asked them to help pray me out from under these monsters to get to settlement so I can get on with my life, what’s left of it. When two or three are gathered together in prayer, mountains move! LinkedIn is also helpful. 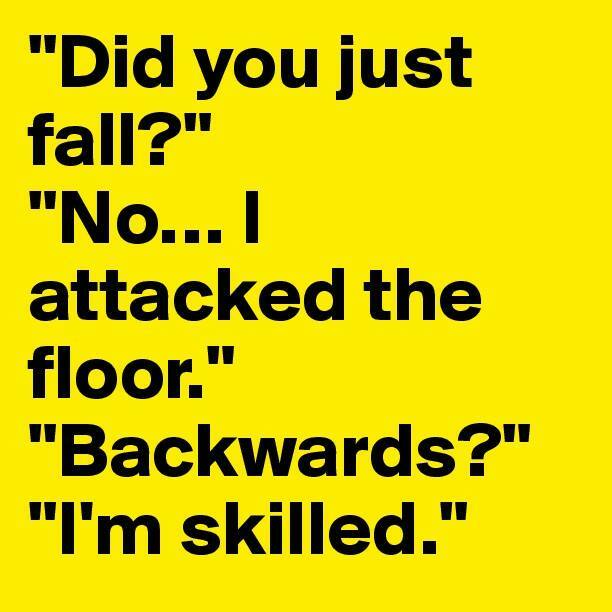 ;D I’m learning lots about surviving #WorkComp. CNA’s training department has viewed my profile repeatedly, several other insurance executives, including Sedgwick. That makes me wonder if the industry realizes that CNA’s contract for Wyndham might be up for grabs after this case, and if more like it are exposed. It’s quite awful what they have done. There are even Judges and law enforcment peeps viewing my profile, regularly. 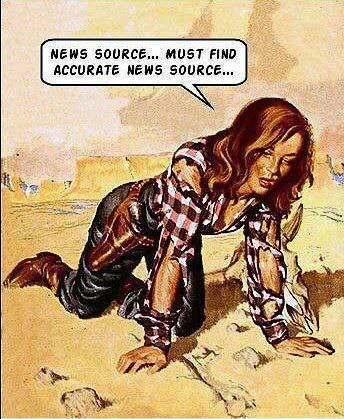 I try to keep the information fresh, although I do perseverate a bit, and appear to be tangential at times…. part of the TBI. Wishing you and yours a happy, healthy, warm new year. Dodge those snowflakes; consider them armed and dangerous. Ask a Physicist. WE ARE THE MEDIA NOW. ASK MORE QUESTIONS. LIVES DEPEND ON IT.